The decision to pay a year's salary to ex-BBC director general George Entwistle, who quit after eight weeks, has been criticised by senior MPs. John Whittingdale, Tory chairman of the commons culture committee, said he wanted to know why the BBC Trust thinks the £450,000 payout is "appropriate". And Labour deputy leader Harriet Harman said the payout was "not justifiable". Mr Entwistle resigned after a Newsnight report led to a former Tory treasurer being wrongly accused of child abuse. He had only been in the job since 17 September. Mr Whittingdale said: "A lot of people would be very surprised that somebody who was in the job for such a short period of time and then had to leave in these circumstances should be walking away with £450,000 of licence fee-payers' money." Mr Entwistle had been dealing with the fallout from a 2 November Newsnight report into an abuse victim's claims which led to Lord McAlpine, a former Tory politician, being wrongly linked to abuse in north Wales children's care homes in the 1980s. The victim, Steve Messham, withdrew his accusation a week later, saying he had been mistaken. And the BBC issued an unreserved apology for the broadcast. Acting director general Tim Davie is to set out his response to an initial inquiry into that broadcast later. An earlier Newsnight investigation into abuse by the late BBC presenter and DJ Jimmy Savile was controversially shelved, but after ITV broadcast the same allegations and there was a growing number of abuse claims made, Mr Entwistle to set up two inquiries. The first is looking at why the Newsnight Savile investigation was not broadcast, while the second, led by former High Court judge Dame Janet Smith, will examine the culture of the BBC during the years that Savile worked there. In a statement regarding the director general's departure settlement, a BBC Trust spokesman said: "The BBC reached a consensual termination agreement with George Entwistle [on Saturday] and agreed to pay him 12 months pay, in lieu of notice. "This reflects the fact that he will continue to help on BBC business, most specifically the two ongoing inquiries." But Mr Whittingdale said he was not convinced by this argument. "I wouldn't have thought that just because you have to help any inquiry into the Savile allegations you necessarily need to be paid such a large amount of money." Ms Harman said Mr Entwistle should not accept the full payout. "It is not justifiable for the BBC to pay double the contractually required sum to the director general on his resignation," she said. "It looks like a reward for failure. "George Entwistle should decline to accept any more than is required under his contract. This is not the way to restore public confidence in the BBC." The Daily Telegraph reported that the total package, including pension entitlements, was worth £1.3m. After the BBC spoke to Mr Davie on Sunday it said in a statement that it was "looking forward" to him setting out his plans on Monday for dealing with some of the issues arising from the 2 November Newsnight broadcast "as a first step in restoring public confidence". Before his departure, Mr Entwistle had commissioned a report from BBC Scotland director Ken MacQuarrie into what happened with this Newsnight investigation into abuse at Welsh care homes. Mr Davie met the BBC Trust on Sunday, during which Mr MacQuarrie's report is understood to have been discussed. Welsh Secretary David Jones said the BBC must tackle "organisational issues" to ensure the quality of its journalism, but emphasised that the abuse should not be forgotten. Meanwhile the process of selecting a new director has already begun. Mr Davie has urged senior corporation managers to "pull together" in the BBC's interests. BBC broadcaster David Dimbleby said Mr Entwistle was not the right man for the job, otherwise he would have stayed to "fight for the BBC". 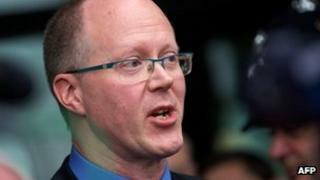 He said staff had been "betrayed" by management. Media commentator Steve Hewlett said the payout was reasonable. "The point is he was the wrong guy for the wrong job at this time and one has every sympathy for him, so I think this is the Trust in effect saying that they bear some responsibility for appointing him, because what does this mean for his career, where's he going to work now?" Conservative MP Philip Davies, who also sits on the culture committee, said BBC Trust chairman Lord Patten should also resign. "He is responsible for the public's trust in the BBC. That trust is at an all time low."